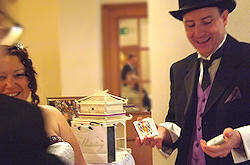 Strolling magic during the photographs - give waiting guests something they'll never forget! 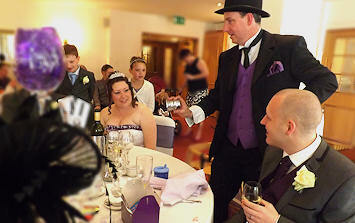 Table magic during the wedding breakfast; each table gets their own 5-10 minute show... then with a bit of ice-breaking walkabout close-up magic for evening-only guests? 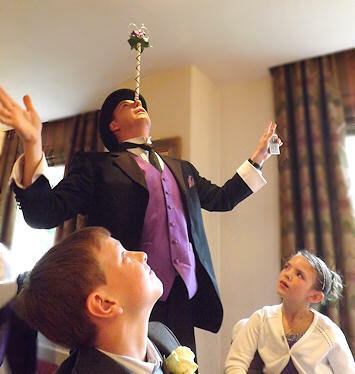 How about a 45 minute show to keep the children happy during the speeches? Maybe with a fire eating finale for everyone to watch? Obviously these are just ideas, it's your day, you will do it your way. Johnny is hugely flexible and is happy to fit in with whatever plans you have. The Free Wedding Directory lists hundreds of Wedding Services throughout the UK and Ireland - Sponsored by Special Day Wedding Invitations.